Welcome to the thirteenth formal edition of the world-renown System Builder. 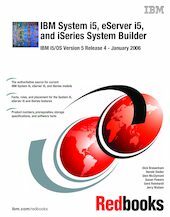 This IBM System i5, IBM eServer i5, and iSeries System Builder, SG24-2155, offers you a comprehensive guide to the IBM System i5, IBM eServer i5, and iSeries processor hardware, related hardware, and System i software marketed by IBM representatives since the introduction of the AS/400e servers in 1996. This technical IBM Redbooks publication describes the newest members of the System i product line, the IBM System i5 Models 520, 550, 570 and 595, as well as the IBM eServer i5 Models 520, 550, 570, and 595, and the iSeries Models 800, 810, 825, 870, and Model 890. This book has been updated to include changes to the software offerings with the latest release of i5/OS software, IBM i5/OS Version 5 Release 4. This book is written for use by IBM System Specialists, Marketing Representatives, Business Partners, and clients. Use this System Builder for detailed System i information and configuration rules. Refer to the companion guide IBM System i5 Handbook, SG24-7486, as a reference for the latest marketing messages on today’s models and software, and IBM eServer iSeries Migration: A Guide to Upgrades and Migrations to POWER TechnologyFont, SG24-7200 , for migration considerations. Placement rules are further described in PCI and PCI-X Placement Rules for IBM System i5, eServer i5, and iSeries servers with i5/OS V5R4 and V5R3, REDP-4011 . Readers who require the latest System i information need to refer to the IBM Redbooks® publication IBM System i Overview: Models 515, 525, 570, 595, and More, REDP-5052. This contains a superset of the system builder type information provided in SG24-2155-12. There are no plans to update SG24-2155. See TIPS0637 for the REDP-4011 version of PCI and PCI-X Placement Rules content that corresponds to REDP-5052 content.